This Instant Pot Mexican Ropa Vieja makes an almost effortless low carb mix of meat and vegetables in your pressure cooker or instant pot. It’s just as delicious as it is easy to make! A colorful feast for the eyes as well as your tastebuds, make this dish with less than 10 minutes of prep time. This Ropa Vieja makes a lovely sauce to pour over rice, or to have with a side salad to serve a tasty, low-carb meal. IS THIS MEXICAN OR IS THIS CUBAN? 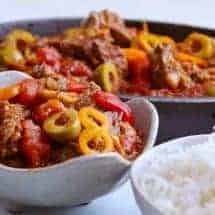 The debate on this continues, but I think there is now a general consensus from the members of my Facebook Group today (Jan 15, 2018), that Mexican Ropa Vieja, especially from the Veracruz region does indeed use both paprika and ancho chile. So I initially had it listed as Cuban, but I’m changing it be Mexican, as that is more authentic for this flavor profile. WHAT IS MEXICAN ROPA VIEJA? 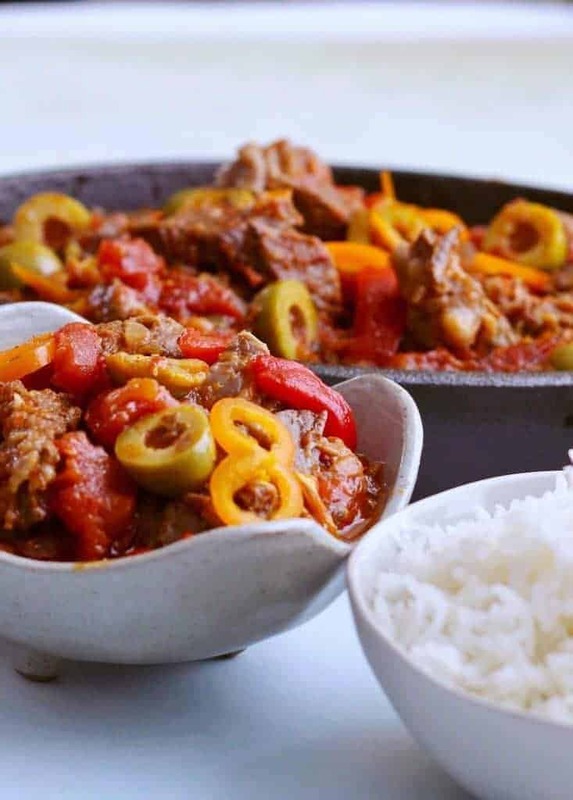 Ropa Vieja means old clothes, and the name telegraphs the final appearance of the dish which, with its long shreds of meat and vegetables, can be likened to a pile of old rags. Thankfully it doesn’t taste anything like that, so go ahead and make it! I tried to make this dish with spices you’d be extremely likely to have at home. This is also why I chose a chuck steak rather than a long piece of flank steak, which is traditional with this dish. I could only find really big pieces of flank steak, and I didn’t really want to make 2-3 lbs of meat this weekend. But if you intend to double the recipe, and prefer to use flank steak, that will also work well, but it will be a little less tender and less fatty. Looking for more awesome Mexican food dishes? Check out my Mexican Corn Eloté! This sweet and savory dish is real easy to make in your air fryer! Another tasty Mexican food recipe you should check out is my Mexican Rice Recipe! This delicious and authentic Mexican rice recipe is a breeze to make in your instant pot. Instant Pot Mexican Ropa Vieja makes an almost effortless low carb mix of meat and vegetables in your pressure cooker. A colorful feast for the eyes as well as your tastebuds, make this dish with less than 10 minutes of prep time. This Ropa Vieja makes a lovely sauce to pour over rice, or to have with a side salad to serve a tasty, low-carb meal. Pour all ingredients into the inner liner of your Instant Pot or pressure cooke and press the MEAT button and set to 30 minutes at high pressure. Once it is done cooking, allow it to release pressure naturally for 10 minutes, and then release all remaining pressure. Turn your Instant Pot on to Sauté and allow the sauce to start boiling so it stays hot. Meanwhile, remove the chuck steak carefully and cut or shred into long slices, and add back to the sauce. Add in the sliced olives and serve with rice or a side salad. can we add some meat ? I made this recipe tonight. It was really delicious. Thank you do much. My husband and I love extra spicy so next time I am doubling the spices. It may be too strong but I want to try it once. I am making the Texas chili next! Thanks for this easy-peasy recipe! It turned out pretty good, although I wasn’t sure about the diced tomatoes so I put the whole can in – I think it would be better if I had drained the tomatoes instead. Also, I think next time I’ll be substituting it with dark chicken (we’re not big beef eaters), and adding some more spice to it. …Or you could substitute pork instead. Every ropas viejas (“old clothes”, i.e. simple comfort food) dish I’ve ever had was made with pork. I made this pretty much as written, although I added a few splashes of sherry vinegar during the boiling process (we love tang!). We absolutely loved it! I will definitely be making it again. I think this is a great recipe and as we have tasked about previously, there are tons of ways to make this dish depending on where you come from in Cuba. However, I do think of you want to call it Cuban Ropa Vieja, it should have Cuban ingredients. Ancho chilies, though delicious, are Mexican. Very different culture with very different foods. I appreciate your feedback. Making tasty food taste authentic is important to me. I never post a recipe without testing and vetting and this one was vetted. However, with all the new feedback provided, I realize it may be time to revisit this one. I will remake it and have new testers re-vet it. If the new recipe gets the thumbs up I will post the revised version. Lana, my husband wants me to make the Cuban version. I’m wondering what ingredients you’d sub/add/take away to do this? Also what does everyone use to sub rice? Riced cauliflower? I converted my Cuban family recipe to instant pot. 2 lbs flank steak. The veggies are strips of yellow onion and green peppers (Or cubanelles if you can get them). The sauce/liquid part and spices would be 8 oz can tomato sauce, 3/4 cup beef broth, 1/4 cup white wine, 2 tbls tomato paste,1 packet Sazon con Asafran, and 1 small hat pimento with juice. Follow the steps in the recipe posted above just using these ingredients. 40 min HP. 10 Min NPR. Would this work well with Elk Pot Roast? I have many pounds of it and not sure what to do with it all! I’m not a fan of the typical potatoes and carrots recipe usually done with pot roast meat. Thank you!! Agree. This recipe is in no way authentic (more like an alternative to taco meat). 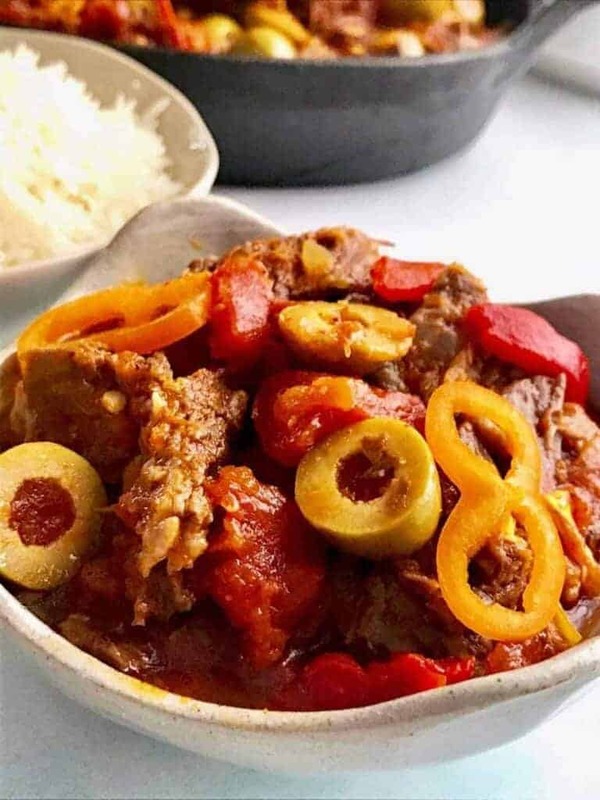 It did provide me with a base recipe to use my Instant Pot for cooking Ropa Vieja – but I did have to alter the recipe. Interesting feedback as I had 2 of my Cuban group members test it before I posted it and they said it was totally authentic and exactly how they were used to eating it. I wonder if regional differences could account for the drastic difference in opinions? This was absolutely AMAZING! I didn’t follow the recipe to a T, but didn’t omit anything and added a few more veggies. We ate it over sweet potato, and the leftovers are going in tamale tomorrow! Thank you Urvashi for another winner! Hi! Does the liquid come from tomatoes or did you add more for it to come to pressure? It comes from all the meats and vegetables in this dish. If you follow the recipe exactly as written you won’t need anything else. This looks delicious. What type of sweet peppers are you suggesting? Looks great! Where is the liquid coming from so the IP comes to pressure? Meat and veggies. I’m a huge believer in using natural, flavorful liquid rather than diluting with water.